If you've ever taken a photo of something and found the photo to have a yellowish or blueish tint to it, chances are your photo needs to be color corrected. The first step to color correction in Photoshop is to white balance the photo. 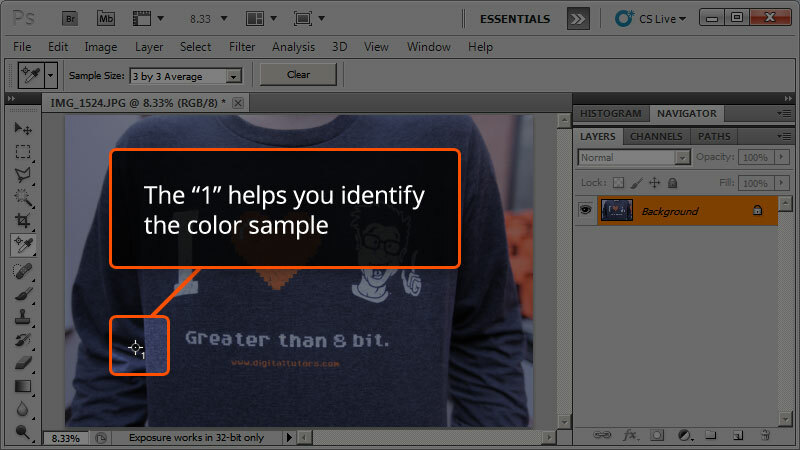 As the name implies, this basically means altering the color information in your photo to make the colors more true to the actual color of the objects in the photo. In this article, you'll learn a few different techniques you can use to color correct your photos through better white balancing. It's worth mentioning that if you have a camera that can shoot in raw, you'll find white balancing and color correction in general is a lot better. The primary reason for this is because the raw format of your camera will bypass the automatic color correction that occurs when the camera takes a photo and lets you make these adjustments manually after the fact. You can learn all about this in the Camera Raw Digital Darkroom Techniques in Photoshop tutorial. But if you're not taking photos in raw or if you need to make adjustments after the fact, there are still plenty of ways you can adjust the white balance for your photo in Photoshop. In this article we'll look at two different techniques for white balancing, one that is faster but gives you less control and one that is slower but gives you a lot more control. 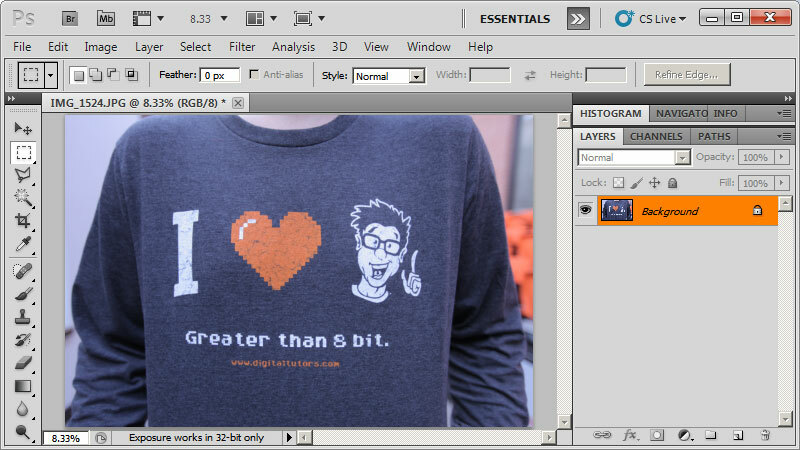 Fortunately, regardless which of the following techniques you use, they all use tools that have been around in Photoshop for a while. This means even though your interface might look a little different depending on your version of Photoshop, the techniques themselves are applicable to just about any version. This method isn't extremely accurate, but it is a great way to get something that looks pretty good without a lot of work. Here's the original, unedited photo that we'll be using as an example for this quick 'n dirty technique of white balancing. 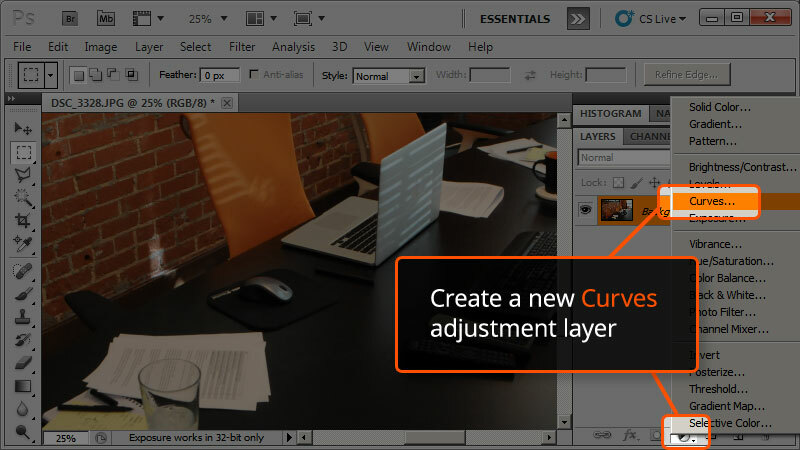 First, create a new Curves adjustment layer. 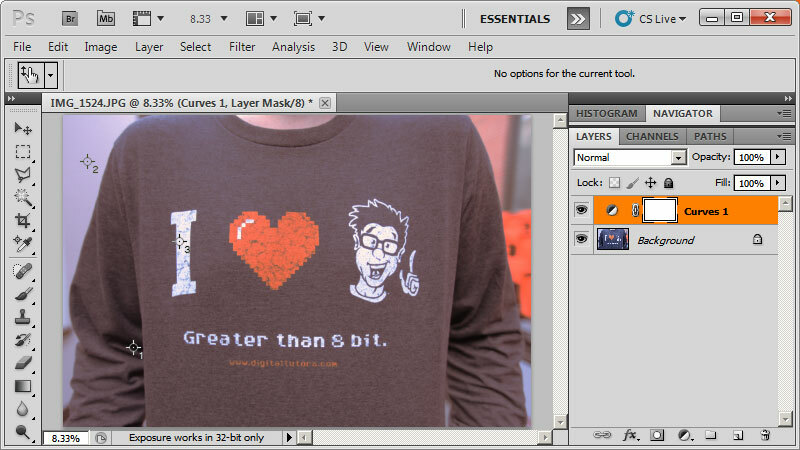 This can be found in the Layers palette as seen in the following screenshot. 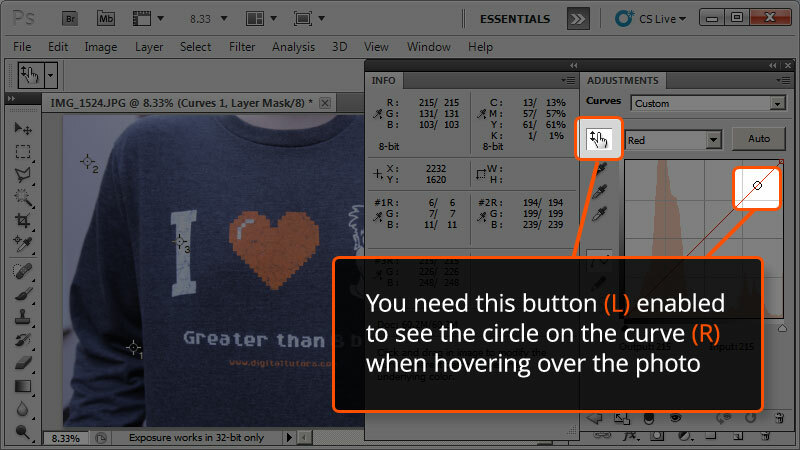 After you have the Curves adjustment layer created, if you double-click on the black and white circle icon in the Layers palette that will open up the Adjustments palette. You can see what this looks like in the following screenshot. 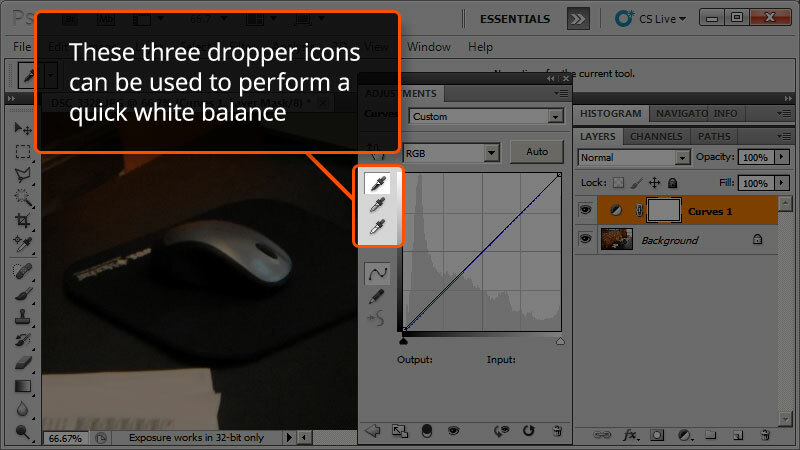 If you look on the left hand side of the Adjustments palette there are three dropper icons. These are, in order from top to bottom, black, gray and then white. 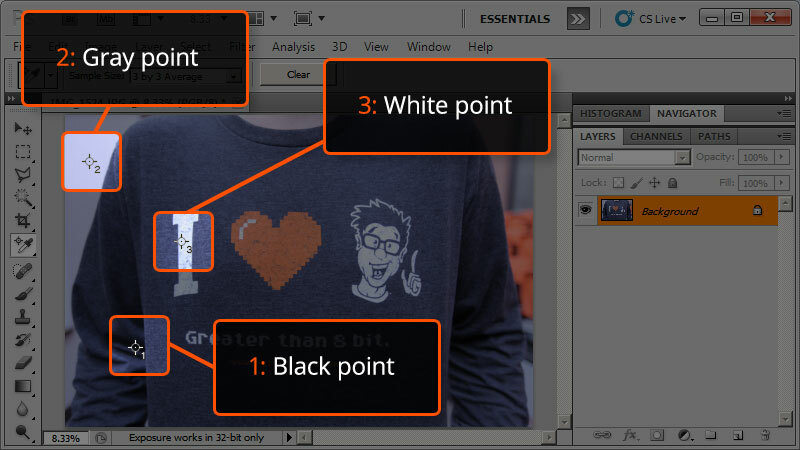 What these do is to set the black, gray and white points in your image to give you a quick white balance. Start with the top one, black, and with the dropper selected click somewhere on your image that you feel should be absolute black. 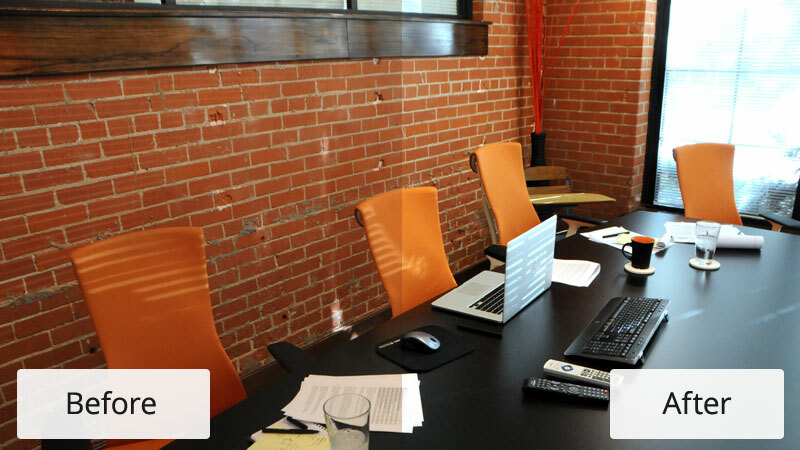 For the example image, we picked the black part of the mouse sitting on the table. Here's a screenshot of this step. 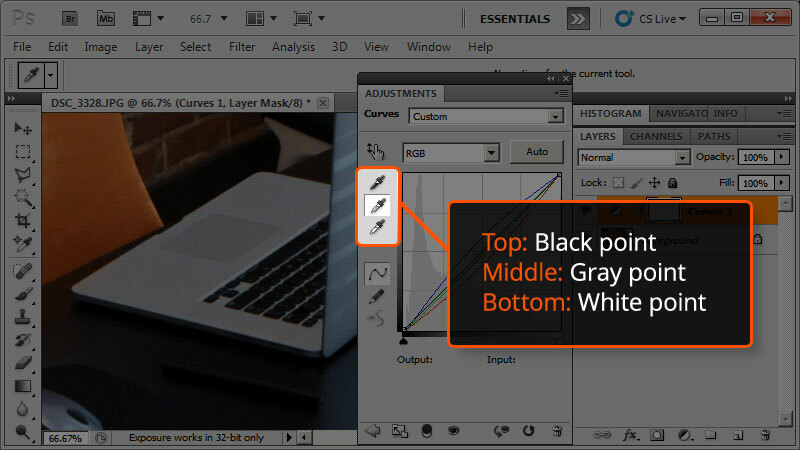 The next step is the same as above, except instead of picking a black area this time you'll want to select the middle dropper in the Adjustments palette and pick somewhere that's a neutral gray in the photo. 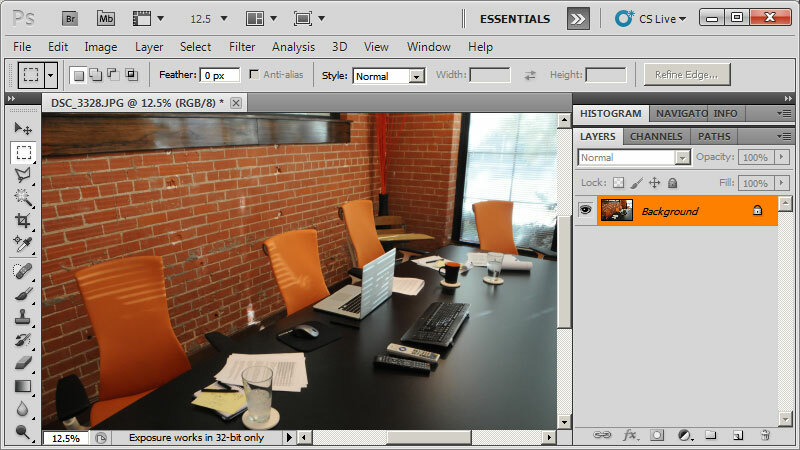 For our photo, we picked part of the computer sitting on the table as seen in the following screenshot. As you might have guessed, the final step of this is to select the bottom dropper and pick somewhere in the image that represents pure white. For this in our image we used a piece of paper that was sitting on the table. It's important to point out there will likely be some clamping that occurs as you can see in this screenshot. That's all there is to it! If you compare this final image to the one above, you'll see quite a bit of difference. The blacks are sharper and the whites are actually white instead of having an orange tint. 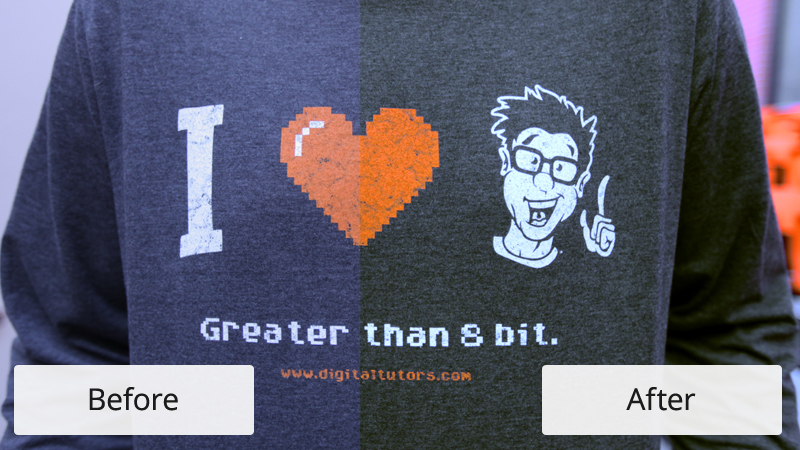 Here's a side-by-side comparison of the "before" and "after". Of course, the steps above might not work for every situation. Some of the downsides to the technique above is that sometimes the white and black can have too much contrast. As mentioned above if you noticed in the Curves adjustment palette, some of the curves are actually clamped. While the exact curves will obviously vary depending on your photo, this technique is prone to causing that excessive clamping. That clamping is what causes too much contrast in the photo and the loss of detail. You can play around with the curves in the Curves adjustment filter to help with this, but an alternative method is to set up better white balancing to begin with. This method, while similar to the steps above, allows you to get a lot better control over the results of your white balance. For this technique, we'll use a different photo that has more of a blueish tint to it. While this is slightly different than the orange tint the previous photo had, you'll see that the techniques to fix this are actually the same. Here's the "before" photo. 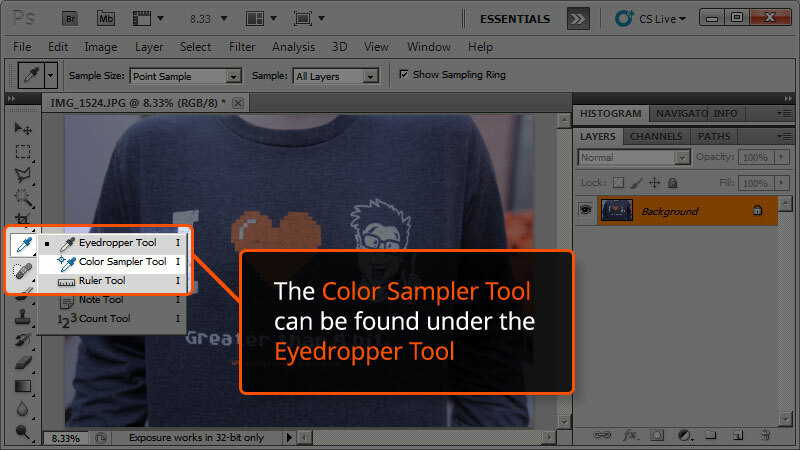 The first step is to open up the Color Sampler Tool. This can be found in the tool bar underneath the Eyedropper Tool or you can use the shortcut Shift + I until you see the icon you see in this screenshot. 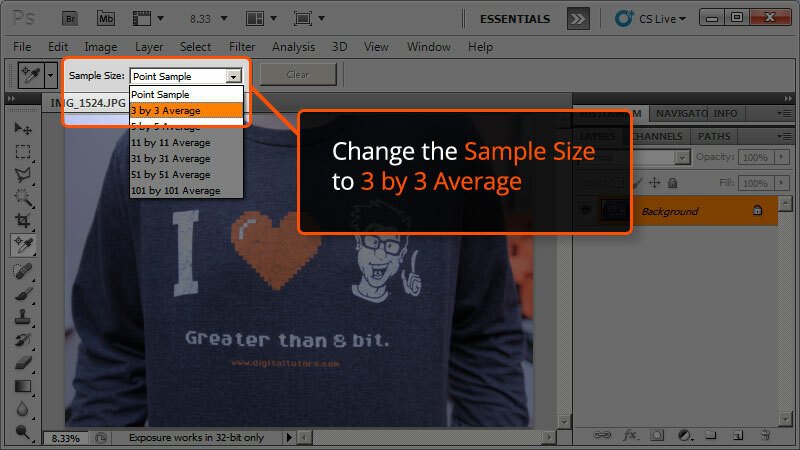 With the Color Sampler Tool selected you'll want to adjust the Sample Size. This can be found in the tool settings. You can use as many as you want, depending on how accurate you want to be. If you're not sure what to use, try using 3 by 3 Average until you are familiar with this technique. For the most part 3 by 3 Average is plenty as it'll give you colors for pure black, neutral gray and pure white. You can find the Sample Size in the following screenshot. Now you need to pick the colors to sample. Pick areas in your photo that best represents pure black, neutral gray and pure white. You don't necessarily have to go in that order, but that's what we'll use for this example. Our first color sample will be an area representing pure black, so we've selected an area in some of the darker shadows. When you pick one you'll notice a number that shows up next to it as you can see in this screenshot. Since we did 3 by 3 Average we'll need to pick three colors to sample. Notice the numbers next to the spots that we picked. As previously mentioned, the order we went in was pure black, neutral gray and then white. So the number one is the area we chose to represent pure black, the number two is the area we chose to represent a neutral gray and then the number three is the area we chose to represent pure white. Here's what that looks like. 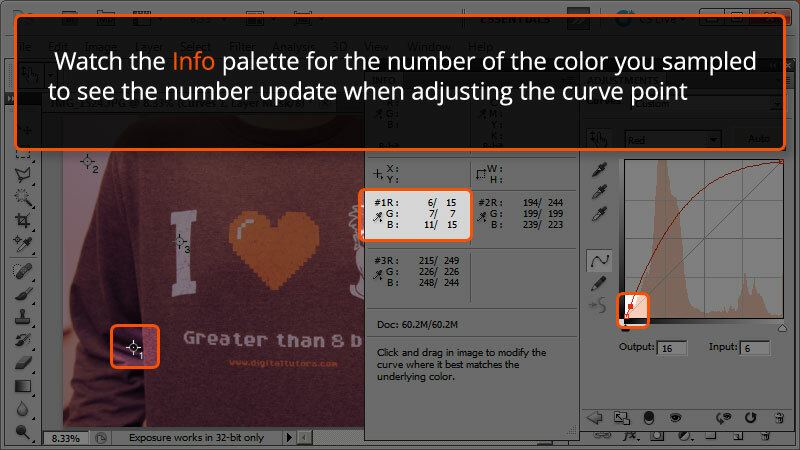 You might notice that Photoshop will automatically open up the Info palette when you're selecting the colors. This isn't really a step that you need to perform, but it's worth mentioning that it's perfectly normal and will be very important to helping perform the white balance. The key here is to notice the three numbers and their RGB values. These will come into play later. We're almost ready to perform the white balance itself. 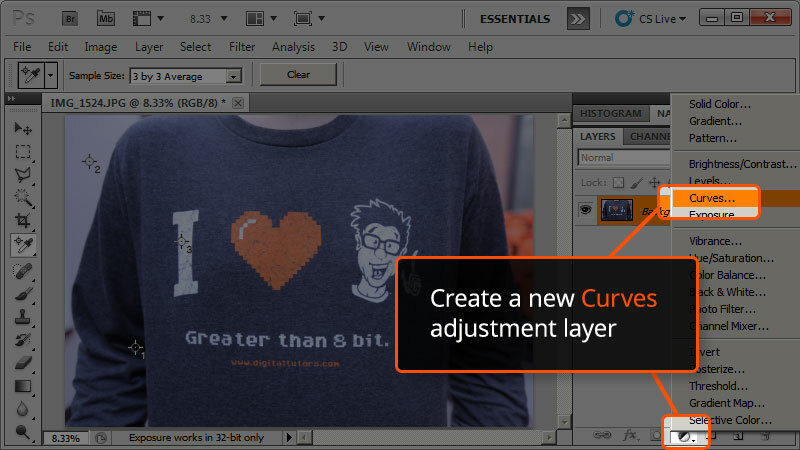 First we need to create a new Curves adjustment layer in the Layers palette as seen in the screenshot below. You'll want the Adjustments palette and the Info palette open. 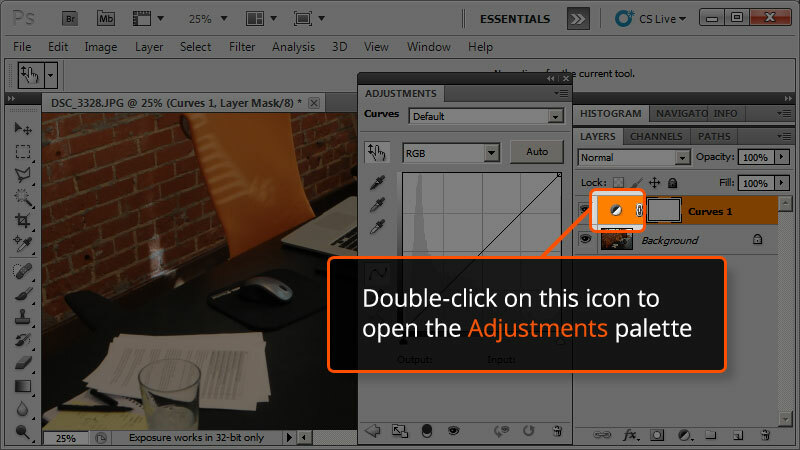 You'll also need to change the channel in the Adjustments palette. By default the channels that display are red, green and blue (RGB), but this technique for white balancing is done one channel at a time. We'll walk through the steps for the red channel and then you can repeat the exact same steps for the green and blue channels to get your final result. Here's where you can adjust the channel. With the red channel selected, if you hover over the image you'll notice there is a little circle that appears on the curve in the Adjustments palette. If you don't see this, make sure you have the highlighted button enabled in this screenshot. We're finally ready to perform the white balance. Hover your mouse over the first color you chose with the Color Sampler Tool and Ctrl + LMB click (Mac users Cmd + LMB click) on it. 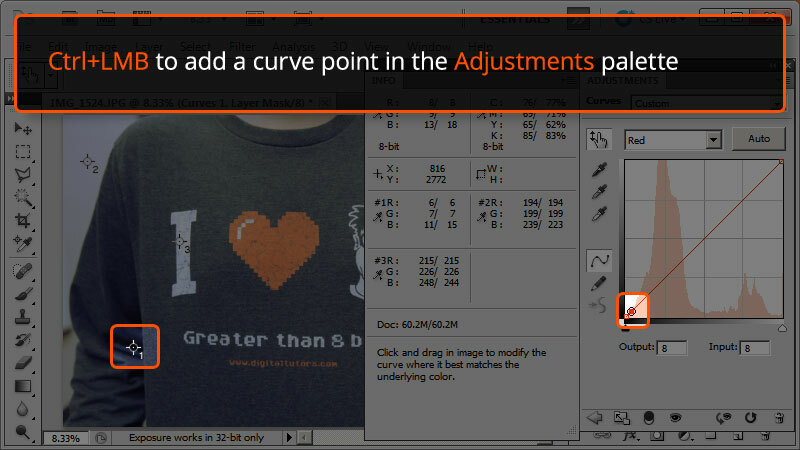 This will add a new point on the curve in the Adjustments palette as seen in the screenshot below. If you can't get a curve point created on pure black or pure white then that means the value you selected is too close to the default points Photoshop already has. In this case you can either pick something slightly further away (a little more towards gray) or use the existing points on the far left and far right in the Adjustments palette. If possible, it's recommended to pick something a little more towards gray but depending on your photo sometimes the best results require adjusting those original curve points. Since we did pure black first, our point is in the bottom left corner. With the point added, you can LMB click and drag on the point itself in the Adjustments palette to control the color at that point. Since this point was from the first color sampled, as you're adjusting the curve point you'll want to pay attention to the values for the color channel you're working on in the Info palette. The two numbers are the original and edited numbers. For instance, a number of R: 24 / 15 means that the red channel originally had a color value of 24 but you've adjusted the curve point to be a value of 15. So the second number is what you'll want to focus on. As previously mentioned, in this example we're focusing on the red channel so we're focusing on the R value by #1 in the Info palette. As you might expect when you're doing the same steps for green you'll focus on the G values and for blue you'll focus on the B values. Since our first point sampled was pure black, ideally the value for that should be around 15. Next, repeat the same steps for the neutral gray and white areas you selected. For neutral gray, adjust the curve point to around 188 and for the white value adjust that to be somewhere around 245. Remember these values don't have to be exact, but they are a target of what to aim for when white balancing using the more accurate technique outlined above. It's important to point out these don't have to be exactly values of 15, 185 and 245. In fact you'll notice in the screenshot below our example values don't even match that. Those numbers are just general guidelines that you can use as a baseline, but every photo is going to be different. You can always come back and adjust these if you need to later on, but while you're working on these numbers try not to focus on the photo itself until you've got all of the channels edited. Here's a screenshot of what our photo looks like after making these adjustments for just the red channel. That's the core of this technique. 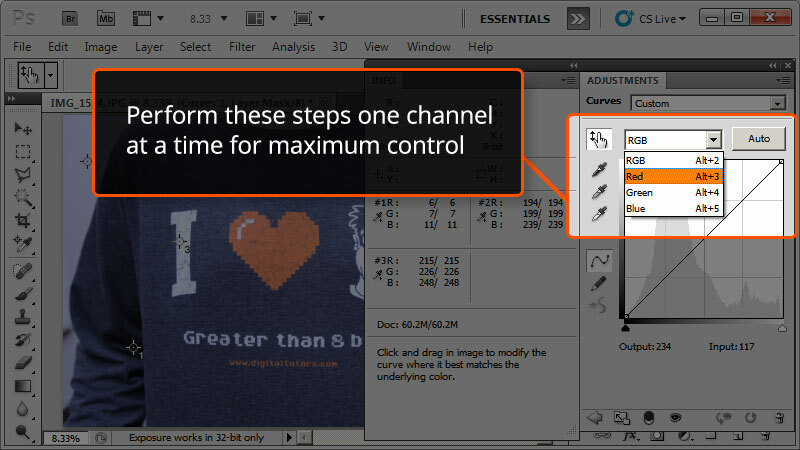 You'll want to go in and perform these same steps for the green and blue channels. You'll notice as you're making adjustments to the other channels sometimes the original values you had set in a previous channel might change slightly. That's perfectly normal and completely alright. It's also worth pointing out that the photo itself might look strange throughout this process. Don't let that discourage you -- it's the end result that matters. Get all of the channels done first and then you can go back and make your final tweaks to make it look better. Even though it's been said multiple times before, it's still worth pointing out one more time that the values are anything but exact. No two photos are exactly the same, so the values are a number to start from. Feel free to make adjustments as you need to for the photo to look better. 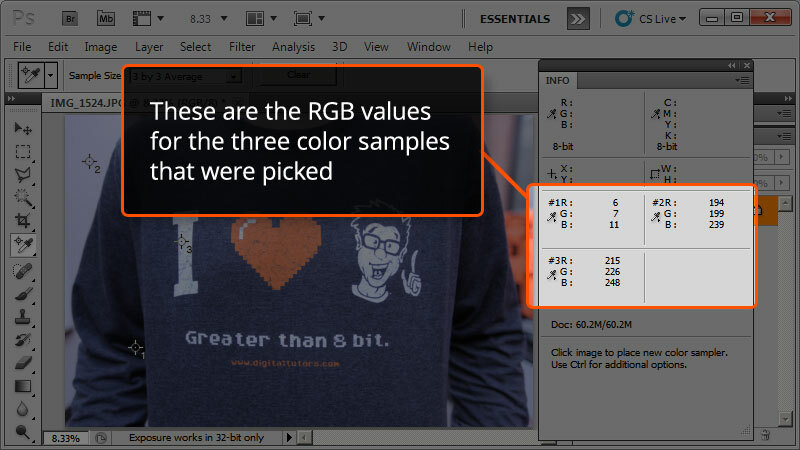 As a general rule of thumb it's a good idea to keep the numbers across all of the RGB channels to be within 3 to 5 values each other as you're editing them. For instance, red could be 12, green 16 and blue 18 but you wouldn't want red to be 12, green 16 and blue 211 because that would cause there to be way too much blue in the photo. After you have all of the channels edited, you can break that rule of thumb and make some more tweaks while letting the photo itself be your guide. In the screenshot below you'll see a range of R: 190, G: 180 and B: 222. Since the blue channel was the last one we edited for this particular photo, we pushed the value for the second point just a little further to help the white balance accuracy and as a result some of the other values adjusted slightly as well. Lastly, here's what the final photo looks like after the white balance. If you compare it to the photo we started with above, you'll notice quite a bit of difference. Your color correction doesn't have to stop here. In fact, it shouldn't. The techniques mentioned above are just for white balancing the photo so you can get much better color correction results. 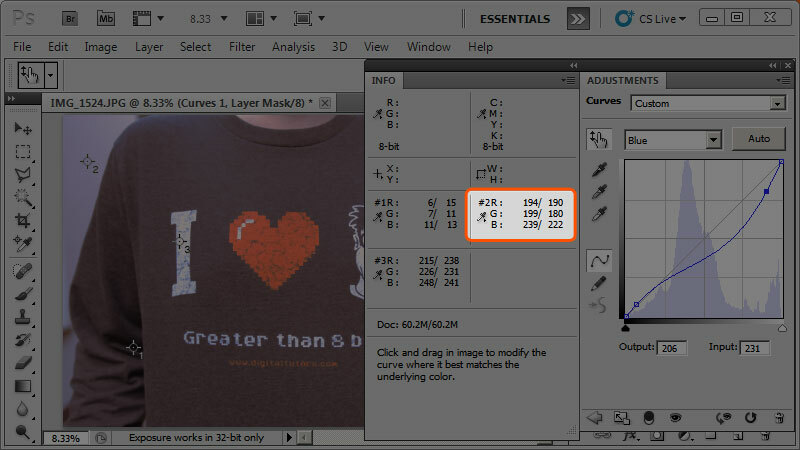 Whenever possible, always use Adjustment Layers for your color correction. This will let you work non-destructively so you can add your stylizations to the photo while always being able to get back to the original if you need to. Depending on your photo the actual steps you take to color correct will vary. For instance, if you like the stylized look that tinting the photo gives then you can use a Photo Filter to apply a nice tint to the white balanced photo. 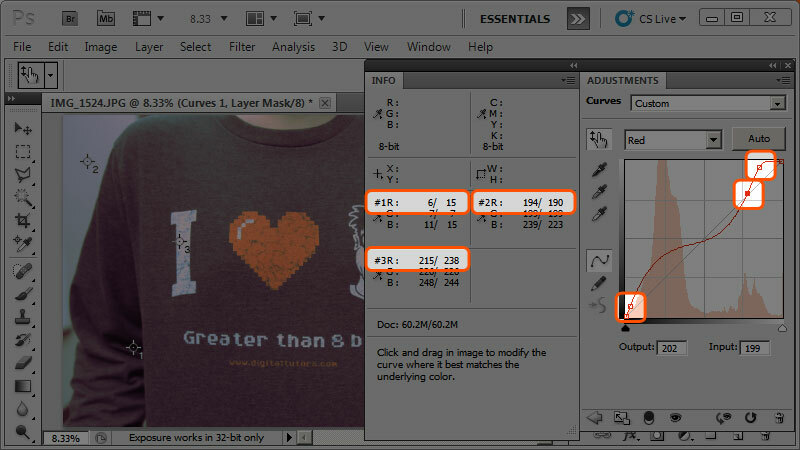 Another popular adjustment layer to use is Levels. 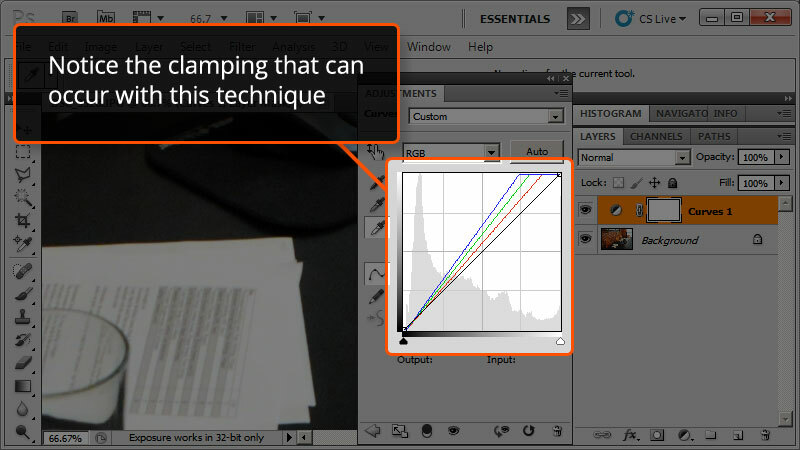 Like the Curves adjustment layer, Levels will let you tweak your colors on a per-channel basis. You can get some really great results just by tweaking the different channels. 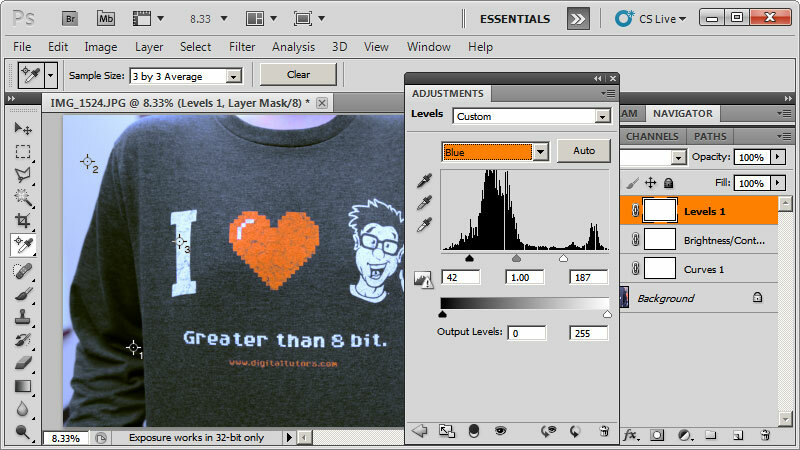 To do this, drag the three arrows in the Levels palette just under the histogram. The one on the far left is the pure black, middle is neutral gray and the one on the right is pure white. Every photo is different and will provide its own unique challenges, but for the photo above this was the final result we ended up with. Notice the Curves adjustment layer from the white balance steps above have been set to a Saturation blend mode. It's important to keep in mind that not every photo needs perfect white balance. In many cases, you may want a more stylized look to the photo. By going through the process of white balancing the photo first, you're able to get that baseline setting that you can then determine whether or not to keep or change in favor of a more stylized approach. Now that you've got an idea of how to white balance your images, the next step is to jump in and start color correcting some photos. If you haven't already, there are some great color correction and image editing tips in the Beginner's Guide to Image Editing in Photoshop tutorial. You can share your own tips and techniques in the comments below or if you have questions about color correction techniques for your photos, feel free to post them in our community forums.